Yet the reaction of some fans who were just unwilling to contemplate the possibility that a Star Wars book could somehow have an intentional Nazi reference—while understandable because the author is well-liked and the book is really good—highlighted the sometimes complicated relationship that fandom has with both the representation of fascism in the Star Wars saga and the influence that fascism itself has had on it. 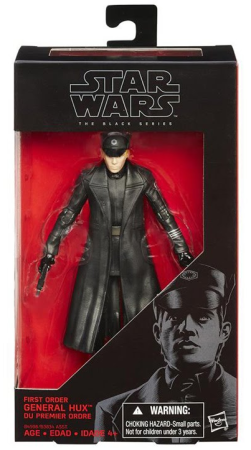 I’ve mentioned before that I personally find the commodification of Imperial chic to be slightly disturbing, but this time I’d like to dig a bit deeper and to talk about the very tortuous relationship that Star Wars has always had with the concept of fascism itself. Is Star Wars a fascist dream? Is Star Wars actually anti-fascist? Now let’s get back to social media. Recently, a meme started making the rounds on Twitter: “Star Wars is not escapism”. It’s a statement that goes straight against Iger’s insistence on Star Wars’ political virginity. But if Star Wars is not escapism, if it’s more than mere entertainment… then what is it? Is it a way of engaging politically? I think we all agree that it is not political engagement. Is it political indoctrination, then? Or is it a kind of political education, perhaps — although this kind of education is pretty much the same as the aforementioned indoctrination, with the only difference being that we agree with the points of view it espouses? 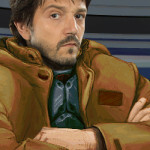 No matter the role that we think that Star Wars has in the way we interact with politics, it’s undeniable that Star Wars is politically important because of its massive cultural weight and the influence it has on what Habermas called the public sphere of the bourgeoisie, the virtual space where we all come together to talk about societal problems. It’s certainly immature—and dangerous—to see politics exclusively through the lens of Star Wars, but that doesn’t mean that Star Wars and politics exist in completely separate spheres. When we complain that Jar Jar Binks seems to recall awfully racist sidekicks of the past like Ebony White or Stepin Fetchit, or when we affirm that, no matter how loudly Lucasfilm insists that things have changed, the creators involved in the saga remain strikingly white and male, we do it for a strong reason: because it matters. Because these things will influence how many children will see the world and try to affect it once they become adults. Its importance compared to real political engagement is probably minimal, but it’s still there. So, when I say that we should be open to acknowledging the strong influence that fascism has always had on the Star Wars saga, I say this because it’s something that really matters, even if, yes, at the end of the day Star Wars is mostly escapism. It still delivers a political message—no matter how much Bob Iger complains about it. From its very inception Star Wars has always been based on nostalgia. George Lucas was calling over to the serials and pulp films that he had loved as a kid and writing his own love letter to these. If we take a look at the original movie, the implied universe seems very clear-cut: we have a tyrannical Empire (so depersonalized and large that it doesn’t even warrant a proper name, as it literally is everything that exists) fighting a Rebel Alliance, a group of freedom fighters working to destroy this tyranny and reestablish democracy. We have an outlawed religion based on a Dao-like concept called “the Force”, again with clearly defined light and dark sides. Our hero, Luke, dresses in white, and the bad guy, Vader, dresses in black. But how does Star Wars really portray this transference of the “burden of empire”? Let’s look at A New Hope, the original Star Wars movie; at how it starts and how it ends. It starts with a very Wagnerian fanfare and the now-familiar Star Wars logo, a logo that, according to designer Suzy Rice, was intended to look “very fascist”. It ends with our heroes walking down a parade straight out of Leni Riefenstahl’s Triumph of the Will, with our proverbial wild man Chewbacca of course not even receiving a medal. We see fascist motifs, yes, but this time they are not applied exclusively to the Galactic Empire. They are applied both to the heroes and to the identity of the saga itself. I’ve cited Umberto Eco’s Ur-Fascism before, as its description of what exactly makes fascism proves useful and accurate time and time again, but let’s take a look this time at how the traits of ur-fascism can apply to the good guys. Can we see a cult of tradition? 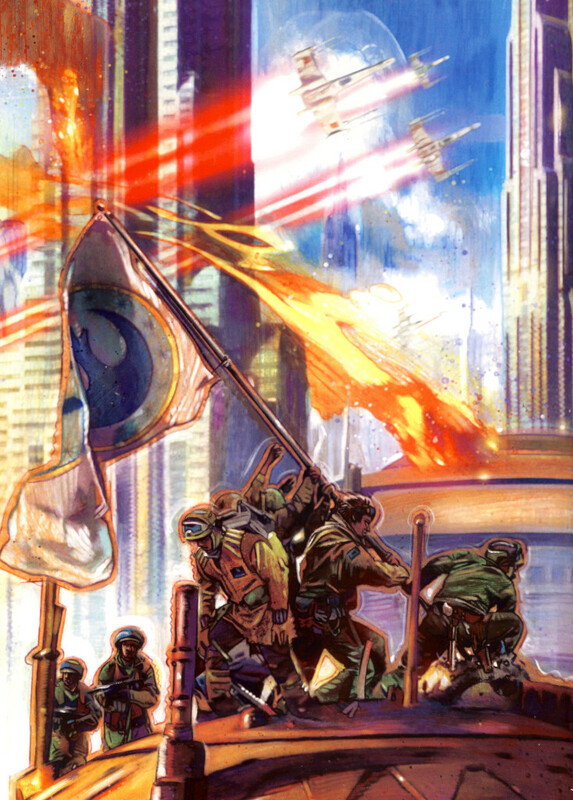 Undoubtedly so: the Rebellion is all about the good old times, when the Republic—a corrupt and unequal Republic—reigned over the galaxy, and they are so obsessed with a defunct cult known as “the Jedi” that they have even adopted one of their salutations as their war cry. What about irrationalism, another trait that Umberto Eco finds in all fascist regimes? As sci-fi writer and noted anarchist Michael Moorcock said in his famous 1977 essay Starship Stormtroopers, the Force can be accessed only by eschewing a rational approach and trusting one’s instincts, so yes, completely. And related to this, do our heroes value action over reflection? Indeed they do: as wise master Yoda says, “do or do not, there is no try.” Is disagreement with the Rebellion seen as treason? Maybe not in the original movies, but the leaders of the Rebellion as portrayed in Rogue One are more than happy to get Galen Erso—a former ally—killed not for any crimes but for any future actions he might do. Is there a xenophobic core to the Alliance? While the Rebellion doesn’t seem as overtly racist as the Empire is (or was, or ought to be, but we’ve had that discussion before) much criticism has been levied at how homogeneously white and male the Rebellion is still portrayed. We can continue down Eco’s list. Does the Rebellion derive its strength mostly from the middle classes? That’s harder to tell, as the saga doesn’t really show us how the galactic classes are related to each other, but at least we can see that the Rebellion is led by Imperial Senate members and monarchists, and they sure seem to see the lower classes of the galaxy—relegated to places like the Mos Eisley cantina or movements like Saw Gerrera’s populist revolution—with a certain degree of mistrust and disdain (that Mon Mothma side-eye!). Rejection of pacifism? Why, that’s the message of Rogue One: that war is inevitable. What about a cult of heroic narratives? Boy. Oh boy. I could go on and on, but this should be enough to prove that we can seriously make an argument that the Rebellion, if not as clearly fascist as the Empire, could be seen as just another side of the same coin. Do I actually think that the Rebellion is fascist? No, I don’t: if anything, the Rebellion has never been described with enough detail to tell us what kind of political agenda motivates it beyond the restoration of the Republic (although author Chuck Wendig has described Mon Mothma as politically centrist and Saw Gerrera pretty much fits the radical leftist archetype), but this vagueness when it comes to defining Rebel politics, this political tabula rasa that the movies offer us, makes this point of view—that the Alliance is nothing but a crypto-fascist organization—a plausible one and thus seems to discredit any supposed anti-fascist message. If we give credence to this new point of view, even as a simple thought experiment, it would seem that there’s no way that Star Wars, so mired in fascist allegory, could be against fascism except as a matter of who gets to be in control: it’s telling the story of two different brands of authoritarianism, two highly hierarchical organizations duking it out for control of the galaxy—indeed, my friend and ETE collaborator Jay Shah relishes in telling anyone that will listen that the old RPG books gave Mon Mothma the very Maoist title of “Leader Mothma”. And why not? After all, duality is a central part of the Star Wars myth. As Leia Organa said in the often-reviled novel Children of the Jedi, “the Force is not the only thing with a light and a dark side”. The Rebellion and the Empire, the Resistance and the First Order, could easily be considered two sides of the same coin. The heavily-armed and well-funded Rebellion, not a true state yet not just a guerrilla force; the state-sponsored Resistance, so uncomfortably similar to right-wing death squads like the Nicaraguan Contras. It works. At this point it’s almost a trope to talk about how Star Wars was heavily influenced by Joseph Campbell’s Hero with a Thousand Faces. Something that has also become a trope? To affirm that the Campbellian monomyth is pretty much an ur-fascist narrative template, a template that has been used by the ruling class through human history to extol the superiority of tyrants over the masses they lorded over. Leftist philosopher and political writer Sam Kriss, in his very thought-provoking essay Smash The Force, has straight up called the monomyth a distillation of the “syncretic cultural milkshake” that Eco notes as a prerrequisite for fascism (Kriss’ essay is, by the way, where I first learned of Campbell’s apparent racism and antisemitism.) Let’s not forget that acceptance of this monomyth is not universal, not even close, and that it’s been criticized by anthropologists, historians, and folklore experts for being Eurocentric, for promoting a messianic and authoritarian vision of what the best way to control a society is, and, well, for being just plain untrue. The prequel trilogy, which I have praised for its subtle anti-bellicism before, doesn’t fare much better if we look at its two sides through this new lens. The Clone Wars are a manufactured conflict that is fought exclusively for the interests of dark monastic cults and capitalist juggernauts. The common man doesn’t even need to fight in the Clone Wars because the elites, the Force-strong demigods that actually rule the galaxy, have created their own myrmidons of metal and cloned flesh. The galactic population is limited to feeling passivity and awe in a war reduced to mere spectacle — and of course to dying off-screen as collateral damage. War is presented as unequivocally wrong — yet the sides in conflict are even more corrupt and tyrannical than the ones seen in the original trilogy. The prequels drop all pretenses and should be praised for this sincerity: the Jedi Knights that Luke revered in the first trilogy are shown as politically powerful, unmistakeably aristocratic, completely unaccountable, and apparently more than willing to remove a democratically-elected leader from power over differences of faith (what are Jedi and Sith if not two different cults of one single religion?). Look at how casually the Jedi discuss the fate of the whole galaxy from high atop their tall spires! Look at how Darth Sidious and Darth Maul do exactly the same thing! The clones marching by the Jedi’s side wear the famous white of the future fascistic enforcer, perhaps because that’s what they always have been. And this portrayal is not accidental. But why would Star Wars focus that much on the multiple faces of fascism? Is Michael Moorcock right when he says that Star Wars unconsciously extends a dangerous fascist message? Is Matt Miller right when he says that anti-fascism is at the core of the saga? Or is everything just a terrible application of the Rule of Cool? Fascists wear the best uniforms, after all. Fascism is deeply ingrained into Star Wars, yes, but in my opinion this ugly component is always portrayed as a negative, be it through the Empire’s brutality or through the Jedi’s aristocratic-by-way-of-eugenics cult. I still wouldn’t dare calling Star Wars an anti-fascist fable because its internal politics are too confusing, too meandering, but likewise it’s hard to see it as just a fascist power fantasy unless it’s through the most shallow of analysis. The only thing we can affirm is that fascism is a part of Star Wars: multiple parts of it, actually. We could be arguing about this for years — some of us certainly have been. But perhaps we should try a different approach: instead of focusing on that nostalgia that I mentioned before, we could consider that when the original movie was released, despite its retro appeal, Lucas was talking to a very contemporary audience. Star Wars has become a cultural artifact through the years but, when we look at is as a contemporary work, one clear message we can easily extract from the surprisingly messy political composition of the saga is that fascism has always been closer than we think. Maybe for all our saying that Star Wars has very clear political content that’s a lesson we have never bothered to learn. That certainly is a possible way to look at it, and it’s one that I’ve been favoring. 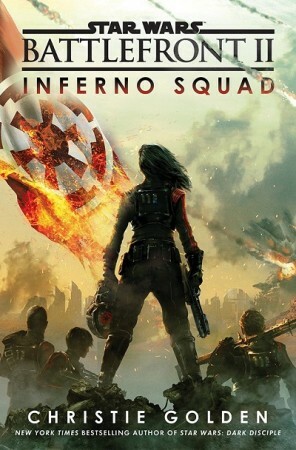 This perspective has never been as explicitly depicted as in the recent Inferno Squad — a video game tie-in novel, of all things. What Iden Versio and her cohorts do has little to do with the Nazis. This kind of clandestine operation, of black ops, that we instinctively recognize as morally repugnant when we see it on the page, could be taken straight from any season of the series 24. It’s a kind of patriotic fiction born out of post-9/11, post-Patriot Act America, where brave operatives lie, cheat and murder their way to defending the strong and lofty principles of freedom, justice, and the right to turn on our AC twelve months a year. It’s not a World War II tale. It’s not Vietnam. It’s now, it’s today, and it’s right here, and worst of all: it’s been right here for decades. I wasn’t kidding when I said that Star Wars and fascism have had a very complicated relationship. We know that it’s present, we recognize it when it appears as marching troops and steel-eyed officers, yet we often turn our heads the other way when we see the deeper roots it has on the saga via the Campbellian archetypes. We will probably never agree on what the political core of Star Wars is, nor on the way the merchandising juggernaut distorts and subverts it. But it’s undeniable that whatever that core might be, many of us have managed to extract a positive message from it. We’ve largely ignored this truth that Star Wars is telling us — that fascism has always been with us — but perhaps we still have time to act on it. 1) I think that the problem is even more complicated than you make it out here. You lean heavily on Eco’s “Ur-Fascism,” which, while interesting, in some ways misleading. As Eco notes, during the Second World War he was “reborn as a free Western man;” his entire account of fascism is an apologetic for Western Enlightenment thought, seeking to reserve the term “modern” for only those classical liberal principles, while excluding fascism as tradition-obsessed, and therefore “not modern.” (I use “classical liberal” to distinguish the broader Western civilization framework of liberalism from its conservative-versus-liberal usage in contemporary American politics). This framework establishes an easy ethical litmus test – modern good, not modern bad – which serves to separate the author and reader (good modern) from the subject (bad not-modern). However, fascist societies *were* modern, and not just superficially. Key fascist concepts like “nation” and “race” were only invented in the last several centuries (Benedict Anderson’s “Imagined Communities” remains the key theoretical text on this development). Modern fascist regimes seek to project these concepts back into history as though they always existed, but in fact the content of fascist “tradition” is in and of itself a modern construction. The best book to my knowledge on this subject is Mark Mazower’s “Dark Continent,” which makes a compelling case that fascism is an intrinsic part of Western modernity, and not an atavistic throwback. As Eco’s analysis suggests, fascists are not the only moderns who distort history by projecting their own parochial views backwards across the entire human past. Classical liberal moderns are happy to accept that fascism is an atavistic remnant of a distant nationalist, racist past, since this allows them to claim (as Eco does) the mantle of “good modern.” Unfortunately, classical liberals who adopt this framework actually end up adopting a good part of fascism’s own ideology – namely, that fascist “traditions” are long-standing historical artifacts, rather than modern constructions. Both liberalism and fascism are modern in their derivation, which makes separating them (both analytically and ethically) a far more fraught enterprise than Eco would maintain. 2) Following from that (overly-long) first point, one of the more interesting aspects of Star Wars is how it deals with the imagined past. What makes the debate about whether Star Wars is “fascist” or “antifascist” so difficult is that, in many ways, Star Wars is neither. Although we see very little of it, the politics of Star Wars as displayed in the movies (and, I would argue, in most of the non-movie material) are distinctly non-modern at a structural level. A key similarity of liberal and fascist modernity is their basic assumptions about the structure of the “world system” – namely, the very concept of “international politics.” Both liberals and fascists assume that the world system will be structured around a series of ethnically-homogeneous and legally-sovereign nation-states. At different times, liberals and fascists have advanced different visions for how these various state-nation-units should relate to each other, expressing a variety of viewpoints on issues like trade, immigration, and war. They have also disagreed over who is entitled to participate in the system as a fully-sovereign nation-state, as opposed to some form of imperial dependency. But a system of sovereign nation-states is generally assumed as the basis for interaction. Star Wars does not have nation-states. This is not just a legal fact, but rather a deeper issue of political philosophy. The terms of conflict between the Old Republic and the Separatists, between the Empire and the Alliance, and between the First Order and the Resistance, all differ substantially from the modern international politics paradigm. Instead, Star Wars generally throws back to a more authentically pre-modern political paradigm, that of universal monarchy or sovereignty. This paradigm, embraced by numerous pre-modern empires around the world, claimed that the only proper organizing principle for all politics was a single hierarchy, a world government, often organized around a single person. In practice, these “world governments” lacked the military, economic, and technological capability to actually conquer the entire physical world, leading to the emergence of several large Eurasian empires. In theory at least, however, each of these empires claimed to be the *only* legitimate polity. Under this theory, the only legitimate conflict was over who would rule the unitary polity. Thus, the Empire and the Alliance, followed by the Republic and the First Order, are engaged in a contest not to establish one unitary nation-state community as predominant over other distinct communities, but rather over who should rule the universal sovereignty, the single community, and how that rule should be conducted. Once this basic difference is recognized, it becomes a lot harder to accurately map liberal-versus-fascist political debates onto the Star Wars spectrum. Is the Empire more nationalist or racist than the Rebellion? What do those concepts even mean in a political dispute without races or nations? Even the Separatists, who challenge the principle of universal sovereignty, do not do so on the basis of “national self-determination” or “authentic racial community” – rather, they seem to try to construct a parallel universal sovereignty that differs from the Republic in degrees rather than in an absolute sense (i.e., the Separatist Congress). Understanding that fascism is a modern phenomenon is especially important in this regard, since, if we were to accept the claims of many classical liberal and fascist writers that fascism somehow authentically represents pre-modernity, we might be tempted to read fascism into Star Wars’ concepts of universal monarchy and non-liberal politics. Since fascism is a modern concept based on modern categories of difference (nation, race), it is historically inaccurate to associate it directly with pre-modern forms of politics, which, while not liberal, are also not fascist. Of course, we can read whatever political subtext into whatever specific scene or statement we want – Star Wars is a fictional universe, and ultimately it is *our* critical engagement with the material that matters. On the specific question of “Is Star Wars as a whole definitively pro-fascist or anti-fascist,” I would have to maintain that it is neither. The politics portrayed in Star Wars are fundamentally pre-modern in concept (a legacy of Kurosawa and other influences), which have no “real” mapping onto modern political questions. 3) On the issue of violence in Star Wars – I know this has been debated ad nauseum in the comments section here, but I still maintain that Star Wars’ portrayal of violence does not support a fascistic narrative. Yes, many Rebel pilots die, but their deaths are generally portrayed as necessary (and tragic) sacrifices, rather than valorous life-defining conclusions. There may be some exceptions – Crynyd’s suicide attack on the Executor? – but in general I don’t think of Porkins’, Darklighter’s, or Dak’s deaths as being particularly “heroic,” except in the more tragic sense of a larger cause advanced. 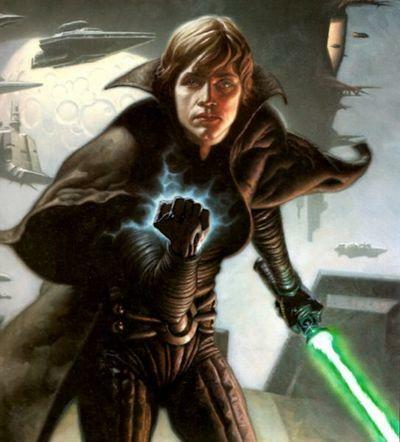 Similarly, while Luke’s narrative may trace his rise to blood-gifted power through violence, his most heroic moment occurs when he rejects further violence. And more than liberalism or fascism, I always saw the Prequels as reflecting a sort of “natural sovereignty” narrative, in which the entire order of the cosmos (i.e., the Balance of the Force) is thrown out of whack by the corrupt actions of those in power (both Senate and Jedi) – this in keeping with the idea that politics in Star Wars is really pre-modern in its conception (natural disaster accompanying political decay is a very common pre-modern trope). While that viewpoint does not necessarily condemn violence entirely, it is certainly a different viewpoint than fascism’s hero-violence. All in all, when it comes to conceptions of violence and heroism, I’d argue pretty strongly that Star Wars is not-fascistic. 4) One final thought – on the specific question of aesthetics raised by comparisons to fonts, cinematography, etc. This is an especially complicated topic, since much of what we associate with the “fascist aesthetic” was, in fact, an attempt by fascists to co-opt various earlier aesthetics as part of “their” race. 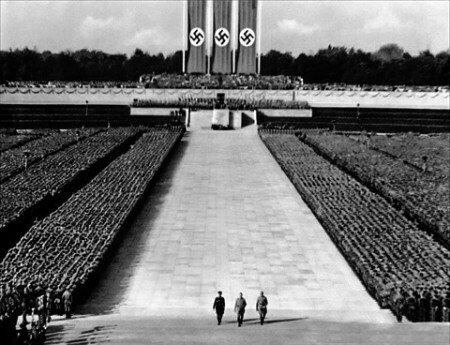 Hence, Riefenstahl’s parade sequence, which would not look out of place in an ancient or Renaissance portrayal of a triumphing Roman conqueror. So, is this sequence Roman, Renaissance, or fascist? I have no idea, but the layers of previous attribution become very complicated, very quickly. If we maintain that this sort of aesthetic has a classical derivation, do we white-wash its contemporary fascist undertones? On the other hand, if we maintain that this sort of shot cannot be considered anything *but* fascist, do we legitimate fascists’ own view of history by allowing them to claim “authentic” ancient kinship from what is in fact a modern interpretive construction? As someone who likes much of the classical aesthetic, I lean towards the former, but the issue remains fraught. Thank you for your very thoughtful comment! You’ve given me a lot to think about. Yes, I lean a lot on Eco’s piece. Mea culpa. Originally it was going to be just a little section, but I found quite fascinating how well it could be applied to the Alliance and it took over a large chunk of the text. The main reason is, of course, that, as you say, it’s extremely easy to add any political subtext to the movies, as they–intentionally–lean heavily in archetypes and it’s almost impossible to accurately map real-life politics to it. Is Palpatine supposed to be Space Hitler? Yes,of course, but also Napoleon, and Nixon, and probably George W. Bush during the sequels, and very soon we’ll be getting narratives turning him into Trump, no matter how little sense it makes. Because he’s the bad guy in charge, as thinly described as possible so that we can project our own fears on him. And what about Saw Gerrera? Is he just an obvious Che Guevara expy? Or are we supposed to read him as Usama Bin Laden? Al-Baghdadi, perhaps? You can do all of these if you want to, and they will all work. This vagueness makes hard for me to believe that Star Wars could seriously be considered to be “anti-fascist”, as it merely uses WW2 imagery to whitewash a very Vietnam War-era narrative. As you very smartly point out, the very peculiar “universal government” situation in the Star Wars world makes impossible to find solid analogues to real-life international politics subjects. But what can it teach us about domestic policy? Perhaps a little more, as the galaxy becomes a scenario where the internal strife in any given modern liberal democracy takes place. The story of Palpatine is not the story of WW2, but the story of his rise to power in Germany–we could even look at the “revenge of the Sith” as a stand-in for Germany’s repressed anger over WW1; we don’t get the European theater but we get a weird and not-very-accurate substitute via the machinations of Jedi and Sith. I’m rambling here and your comment probably merits a considerably longer and more thoughtful answer. Sorry about that. I’ll probably be back later with more thoughts. Thank you again for commenting! I will be mulling over the very good points you made! To be clear, I think that Eco’s work is a very good starting place to talk about what fascism is and isn’t, and a really good frame for your piece – I just disagree with Eco on a lot of the specifics of what makes fascism fascism. Still very thought-provoking. In addition to Hitler, or Napoleon, or Nixon, or Bush, or Trump, I’d add the Qin Emperor, or Augustus, or Abbas al-Saffah, or Tokugawa. Similarly, we could add Themistocles, the Trung Sisters, Robin Hood, or Hassan i-Sabbah to the list of comparisons to Saw Gerrera. The timeframe expands beyond the modern Euro-American period and into a much larger chunk of historical and even mythical experience. The bigger issue with Star Wars is that its politics is so timeless (generic?) that basically anyone can stand in for anything. Certain structural factors may bear similarities (the cunning and ruthless manipulator rises to the top; the scrappy underdog will win at all costs), but to map these onto specific political programs or causes is a product of the audience’s critical interaction with the work, not really an aspect inherent in the work itself. In that sense, I agree with you that Star Wars isn’t an obviously anti-fascist piece. However, I would equally maintain that Star Wars isn’t an obviously fascist or pro-fascist piece. One other thing I’ve noticed in some of the newer books is that they’re trying to add in elements of Soviet/Communist states – so sometimes you get an odd mixture of ‘bad capitalist money-grabbers’ and ‘inefficient Soviet leadership’ rolled into one. For example, in John Jackson Miller’s ‘A New Dawn’, the Empire (in the role of the state) takes over privately-owned farms and forces people to relocate into urban areas where they pursue careers in heavy industry. At the same time, you have private ownership in the form of large conglomerates, snobbish noblemen with connections, and evil businessmen. The visual propaganda posters we’ve been seeing, too, sometimes rely both on elements from old Soviet posters and on WWI + WWII British recruitment posters. But these are all nice simple elements of ‘badness’, so I definitely can see why they’re used as a quick, easy way to show civilian suffering in a space opera setting. Anyway, there’s definitely a mish-mash here of various totalitarian systems, visually and thematically. All of this I think ties in nicely to the fact that Star Wars is, after all, a product made in USA’s cultural circle. I think it was important for USA viewers to quite easily recognise that ‘these are the bad guys’. Or maybe it was just a natural-feeling thing to think of when you’re from the USA and need to imagine opponents for your freedom-fighting heroes. So they applied a bunch of easy references to real world powers who were historically enemies of the USA and who are also popular opponents in action movies: Colonial-era England/UK, Nazi Germany, Soviet Russia… Mixed it all up, added some scary lasers and space weapons, and there you had it – an enemy force fit for a space opera, that the public will instantly know what to expect of. I think I’ll agree here — I think the bigger emotional tie (at least in the original films) would be a hearkening back to a simplified view of the American Revolution. You have the evil (British) Empire versus the farmhand and smugglers and independent types aided by the religiously pure Jedi who were hounded out of the Empire. Now, the styling of the Empire is definitely playing off of 20th Century fascist themes — but the Empire feels more like a Colonizing power — the main villain in ANH is actually “Governor Tarkin”. Add in that with the Senate being dissolved there is no real representation. There’s so many good thoughts there, and I don’t have a whole lot to add but just wanted to say I’m grateful for a space to have these conversations. I especially like John’s conception of the Star Wars universe as a galactic monarchy; I think that clarifies a lot, and also raises additional questions I hadn’t though of before, such as: If there’s a galactic monarchy, is there some sort of “divine” right to rule guaranteed by the Force? And if there is, and the rulers do things to lose the Force’s “mandate of Heaven,” does the Force then act to replace the rulers? And then could we say that the First Order/Snoke is trying to reclaim this divine mandate by emphasizing ideological purity within their own movement? Etc., etc. It’ll be interesting to see! Jar Jar Binks is not racist. That is just exaggerated and ridiculous prequel hater propaganda. Also, Chewbacca did get a medal in both Canon and Legends, as confirmed by books and comics. While I do find this article interesting, I’m not sure it isn’t slightly misplaced in Star Wars. What I mean is this. While Star Wars will make allusions to politics, I don’t know whether or not the authors are trying to make overt political statements. It seems to me that they are simply using political elements in an impressionistic fashion (almost to set a mood) rather than a technical fashion to comment upon politics. Likewise, there are hard-political science fiction stories, where much thought goes into potential political development; I don’t think Star Wars is this either. The point isn’t meant to be an evaluation of a potential political system – rather the system is there to set the stage for the specific adventure. So while the article is interesting, it sort of strikes me like analyzing Star Wars on its scientific merits. While you can critique the fact that you hear sounds in space in the dogfights in an utterly unscientific way, I don’t think Lucas’ goal was to present possible space dogfights in a scientific fashion. It may be an accurate critique, but but its not quite on point. Likewise, addressing the politics here almost seems to be slightly off skew – like lamenting that an impressionistic painting lacks photo-realistic elements, or that the still life of fruit isn’t very dynamic. It just doesn’t mesh. Or maybe like this – it is a mythical take on political interaction, not a specific case study. It just seems as this is the wrong form of criticism — reading poetry as prose or something like that. 1) A work does not need to be overtly political in order for us to criticize its political leanings. Even works that are not about politics can have important things to say about the human condition, which may have political implications. For example, when stories consistently prioritize the need for super-powered heroes in order to save us from evil galaxy-spanning conspiracies, problems that cannot be solved through some sort of reasonable discussion but instead can only be resolved through unlimited willpower and violence, we might wonder whether there is something fascist about that work. This is a debate that has surrounded superhero fiction since the 1930s, and insofar as Star Wars is a superhero story, I think it makes sense to consider it in this regard. 2) Star Wars *is* a political story. This comes across most especially in the Prequels, where we see the decline and collapse of a democratic political order in the face of war and tyranny. But insofar as Star Wars is always about *war*, I would argue that it is always political, even if the nitty-gritty of the politics is not the focus. Theorists of war have consistently noted its political character – Clausewitz wrote that war derives its logic from politics. Insofar as this is true, I think it makes sense to at least consider what the content of that politics might entail. This, 100%. Not only is authorial intent not required for a work to make a political statement, some statements are all the more powerful when made subconsciously. I don’t put quite as much weight on SW’s implicit statements as David does but they’re definitely there if you choose to see them. What they’re not, imo, is particularly consistent—so the ballgame is what you choose to take away.